When I first began writing, it took me a while to find my voice, the unique way that I tell a story. Eventually, I was able to find a cohesive way of expressing myself. I’m not saying it’s genius. Just that when I write, it all pretty much comes out the same way now, instead of the scattershot way it did when I began. It doesn’t take much searching to find books that explore a writer’s voice: what it is, how to develop one, how to change it. There are countless blog posts covering the same. More difficult to find is information on developing your reading voice. What do I mean by a reading voice? The type of literature that you prefer to read. An established reader may be able to define their reading voice pretty clearly. Did you see how I didn’t say old? We aren’t older readers, merely established. Anyway, I digress. When reading, I usually gravitate towards Urban Fiction, often with a strong female lead or secondary character, and Steampunk with a well-defined world. That doesn’t mean that I don’t read anything else. These are just what I might call my ‘go-to’ books. That’s all well and good, Adam, but why a whole post for something so simple? Ah, yes! I’m glad you asked. As I said, for an established reader, figuring out your voice shouldn’t be too difficult, even if it has changed over time. For a younger reader, it can be a discouraging or difficult procedure to figure out what you like. How do I know this? I happen to live with two young readers. I do as much as I can to encourage my boys to read. We read together. If they read something on their own, I read it too, so we can discuss it later. We make regular visits to the bookstore. Often I’m just taking swings in the dark, suggesting books I love, or a friend has recommended. It doesn’t always work out. There is some good news. My older son, now nine, is starting to understand his own reading style. It helps that he had a great teacher last year. She encouraged him to read many different types of books. And, his librarian did an excellent job of helping him find new books in the styles that he found enjoyable. Under their influence I began to see his reading voice taking shape. It has been really cool to watch. As my youngest, now six, starts to expand his interests, I look forward to helping him find his voice. To that end, I’m interested in tricks, tips, and advice. How did you develop your reading voice? What do you do to help your students or children? Tell me in the comments below. Adam Lehrhaupt has traveled to six continents, performed on Broadway, and lived on a communal farm. He firmly believes that opening a book is a good thing, even if there are monkeys in it. Adam currently lives in the suburbs of Philadelphia, PA, with his wife and two sons. In his spare time, Adam does a bit of writing. His writing spans multiple styles, from poetry to fiction to nonfiction, and is primarily geared towards children. 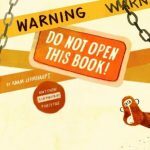 Adam’s first book, Warning: Do Not Open This Book!, came out on August 27, 2013. I have a 9-year-old son, too. The thing that has worked for him is something you touched on: exposing him to many different kinds of books (or not books – anything with the printed word!). Sometimes I cringe at the titles he picks up, but by letting him read whatever appeals to him at the moment, a happy, voracious reader has evolved. I just had to let go of the idea that he would immediately take to the books I thought were “best.” Now, when we do ‘agree’ on a good book, it is just an added bonus and we usually read it together! Loved your post. It’s been difficult for me as a parent. Unfortunately, in my son’s elementary school there isn’t anyone taking a lead in exposing children too kidlit. By accident a came across Donalyn Miller’s book “The Book Whisperer” and my journey began. Then, I started scouring the internet for blogs & websites on kidlit. Now, I’m reading the 8th edition of Essentials of Children’s Literature published by Pearson. Little by little I’m trying to expose my son to all the different genres. For now my nine year old son enjoys realistic contemporary fiction, absurd short stories, and nonfiction involving engineering and space (early chapter books). Thanks to you and all the other AWESOME kidlit bloggers and websites out there, I’ve been able to expose my son to some pretty GREAT books! I love the idea of having a ‘reading voice’! My daughter just turned 4, so we’re just beginning to find her voice, I guess. Right now, I’m just noticing. What books does she pick again and again and again. What does she notice in a story? What makes her laugh? I’m just noticing right now, but eventually I’ll start recommending books both familiar and different to her voice. Have you tried a book swap? It’s easy to organise in a library or school and is a fun way for children to share the books they have enjoyed.Your school or library can also set up a page on their website where children can post reviews or drawings of the books they have read and say why they think other children will like them.